October 2017 was the moment of reaping the whirlwind as the de facto capital of the self proclaimed Caliphate in the Syrian territory fell to US backed Syrian Democratic Forces. The recapture of Raqqa has its symbolic significance. Raqqa was portrayed by ISIS as the revived version of the old Caliphates of the Umayyad (661-750 CE) and the Abbasid (750-1258 CE). Parallel to the western powers, Iran, Russia and Iraq played a significant role in the physical demise of ISIS in Syria and Iraq. The news of the liberation of Raqqa in Syria and Mosul in Iraq, was greeted with great enthusiasm by Tehran, Moscow, Washington and Europe. Since then, many commentators and media outlet began to anticipate who is the main winner in Syria in the post-ISIS era. However, before attempting to answer this question, it is crucial to discuss the objectives of the powers involved in the Syrian battlefield. By mid 2014, the Syrian conflict reached its violent peak when ISIS penetrated the Syrian borders and proclaimed Raqqa as its political centre. The rise of ISIS in the region created anxieties not only in the European capitals but in Tehran, Baghdad and Erbil as well. Since the beginning of the Syrian uprising, the Iranian government supported Assad’s Syria, its traditional ally in the region. Since the beginning of the Iranian revolution in 1979, Assad’s Syria supported Iran against Saddam’s Iraq. Syria also provided a platform for Iran to strengthen its ties with its Lebanese allies, Hezbollah and the Palestinian factions of Hamas and the Islamic Jihad. During the post Hafez al-Assad era, his successor, Bashar al-Assad continued supporting Iran in fortifying a frontline against Israel. Both Tehran and Damascus portray their alliance with the Lebanese and the Palestinian factions as the “axis of resistance” against the regional hegemony of Israel. The fall of Assad’s Syria, therefore, could have posed a significant blow to the Iranian project of “resistance” in the Levant. In the wake of the rise of ISIS, Tehran commissioned its regional allies, Hezbollah and volunteered Shi’a militias from Iraq to effectively enter the battlefield in Syria to support Assad’s government. Parallel to Iran, Putin’s Russia officially deployed its armed forces and launched aerial and land operations against anti-Assad forces including ISIS and Al-Qaeda affiliated Al-Nusra front. The main goal of the Kremlin is to salvage its ally in Damascus. On the other side of the spectrum, a coalition of western powers conducted aerial support to the Syrian Democratic Forces to oust ISIS from northern Syria. Effectively, the Syrian Kurds did not enter the battleground of the Syrian civil war. For the Syrian Kurds, the main goals have been to achieve a limited autonomy in northern Syria and to fight ISIS. Therefore, the Kurdish factions and their Arab local allies welcomed support from both the US/European coalition forces and from Moscow. The SDF forces proved to be effective in fighting ISIS by capturing the capital of the so called Caliphate. Since the beginning of the Syrian uprising, Turkey’s Erdogan on the other hand invested significantly in supporting the pro-Turkish Sunni Arab forces against Assad’s regime. Seeing the Syrian Kurds holding the upper hand in the north-east and north-west of Syria in post ISIS era, Ankara anxiously launched a military operation code named “olive branch” in February-March 2018. In doing so, Ankara is pursuing three strategic objectives. The first goal is to create a buffer zone in northern Syria to oust the Syrian Kurds from its borders, and to prevent the discourse of Kurdish autonomy from spreading to its own territory. The second goal is to secure more popular support by projecting a “nationalistic” discourse among the conservative Sunni-Turks who are concerned about any possible changes within Turkey’s immediate borders. The third goal is to engineer a new bridge for the pro-Turkish Sunni Arab forces to gain a foothold in northern Syria in the wake of Assad’s rapid victories throughout the country. To this end, Turkey’s Erdogan is facing several challenges; first, the military operation may alienate Ankara’s NATO partners who have established a successful alliance with the local Syrian Kurds against the ISIS forces. Second, the prolonged military campaign may further destabilise the region and provoke a new phase of ethnic conflict alongside Turkey’s southern borders. Third, for Ankara, it can be a financial burden to protract military operation outside Turkey’s borders. 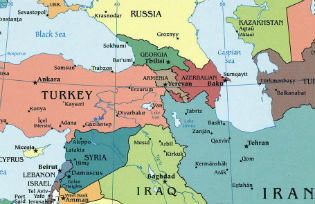 In addition, the regional states such as Iraq officially objected to the Turkish military campaign. This can limit Turkey’s expansion of influence within the region through military means. One may argue that in the face of the decline of ISIS, seemingly, Iranian and Russian political and military policies have been palmier. Since the Syrian crisis began, Moscow is pursuing multi-dimensional policies. On one hand, Kremlin is continuing its military campaign in supporting Assad’s regime and, on the other hand it has been organising a series of round-table negotiations between the Syrian factions, more notably in Astana and in Sochi in coordination with Iran and Turkey. Recently, the Syrian army with military support from the Russian air force has gained the upper hand in Eastern Ghouta near the capital city Damascus. Russia also attempts to maintains connections with all parties involved in the Syrian crisis to have an influential voice in conducting necessary negotiations. Parallel to this, since Hezbollah entered the Syrian battlefield, it has gained significant combat skills and its forces succeeded in establishing local networks. Tehran has therefore succeeded in cementing its presence without an official deployment of its armed forces. In doing so, Iran continues to fortify its hegemony within the Levant as a counterweight to Israel and other regional forces, namely Turkey and the Arab Gulf states. However, recent developments may influence the political equilibrium on the ground. In response to an alleged gas attack, French, British and U.S. forces launched a bevy of airstrikes against Assad. The trilateral military operation was the biggest coordinated intervention by western powers since the beginning of the Syrian crisis. Although western powers stated that the strikes were aimed at degrading Syria’s chemical capabilities, in fact the operation was meant to send a signal of warning to Assad’s regional supporters, Iran and Hezbollah. Russia’s inaction over the western airstrikes and its unsuccessful bid to condemn it in the UN security council shows Moscow’s influence in Syria is not necessarily infinite. Facing imposed economic sanctions due to the Ukrainian dossier, Russia seems reluctant to escalate the conflict with Washington to a practical level. Despite Trump’s “mission accomplished” message, questions were raised over Washington’s Syria strategy. Trump inconsistently announced that he wishes to disengage the American troops in Syria. Meanwhile, the latest trilateral action is supported by Germany, Japan and the European Union. Therefore, a format of influential powers is being created to engineer the western formulated political process. Notwithstanding, one potent enemy such as ISIS may have been defeated, but the battle for Syria’s political soul is far from over. In fact, to obtain stability in the region military campaigns are not the solution, rather, there needs to be initiatives that involve all elements of the Syrian population. Seyed Ali Alavi is a teaching fellow at SOAS, University of London, department of Politics and International Studies. His expertise lies in the International Relations of the Middle East.